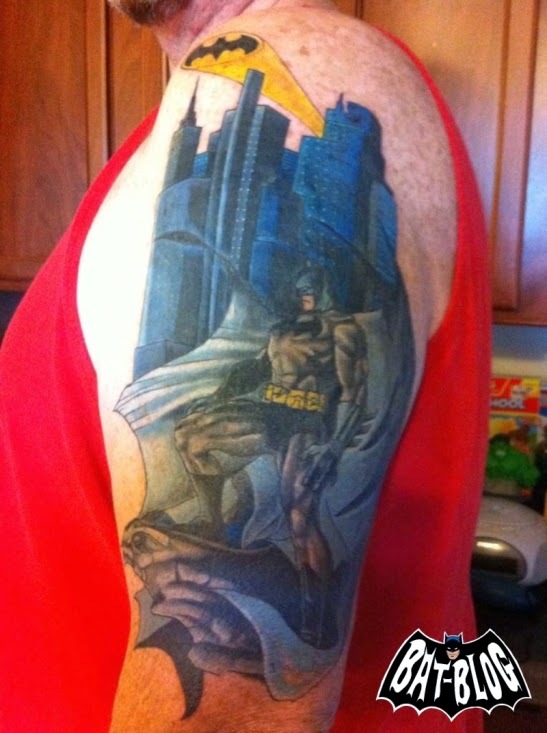 The BAT-BLOG is pretty famous for featuring Batman Tattoo Art. It all started with me just sharing a photo of a nice Bat-Tat that I randomly came across. I shared it because I thought it had a cool "Graphic Art" angle. But then what happened was I started to get a ton of submissions from various fans of the site. They had all recently got some ink done & decided to share. It's one of those wonderful accidents that happen when you are engaged in blogging. I love the personal side of my blog, the way I am connected with people. So, I'm always incredibly grateful for submissions. It means that people enjoy an aspect of the site and want to be involved. It also adds some variety to my posts and creates some magic. Like they say, "Variety is the spice of life". Here's a tattoo sent in to us the other night and this guy was inspired by Jim Lee's artwork that appeared inside the now super-famous HUSH Graphic Novel. The colors are sharp and bright, very well done. (Thank you for sending it in).